Amphinomid polychaetes are commonly known as fireworms due to the burning sensation once their chaetae (fine 'hairs') break after penetrating our skin; however specimens belonging to only a few genera produces the stinging sensation. They are brightly coloured and can reach quite a large size, up to 50 cm long. Fireworms thrive in intertidal zones and can be abundant in coral reefs or rocky areas, although there are some deep-water genera. 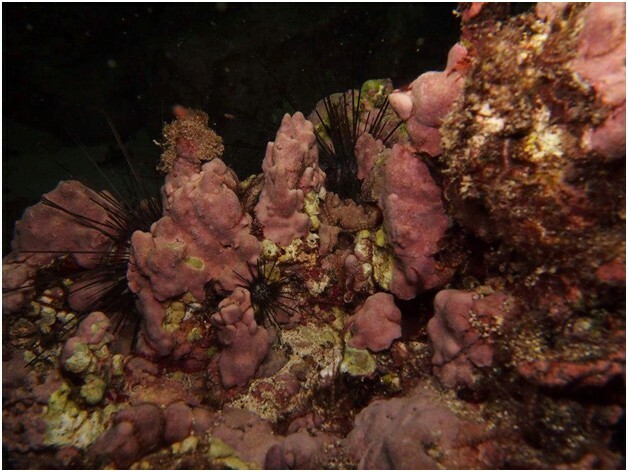 During the dive surveys of Ascension Island the SMSG team found two species of fireworms which have now been identified by Beatriz Yáñez Rivera, of the Universidad Nacional Autónoma de México, as Hermodice carunculata and Eurythoe complanata. 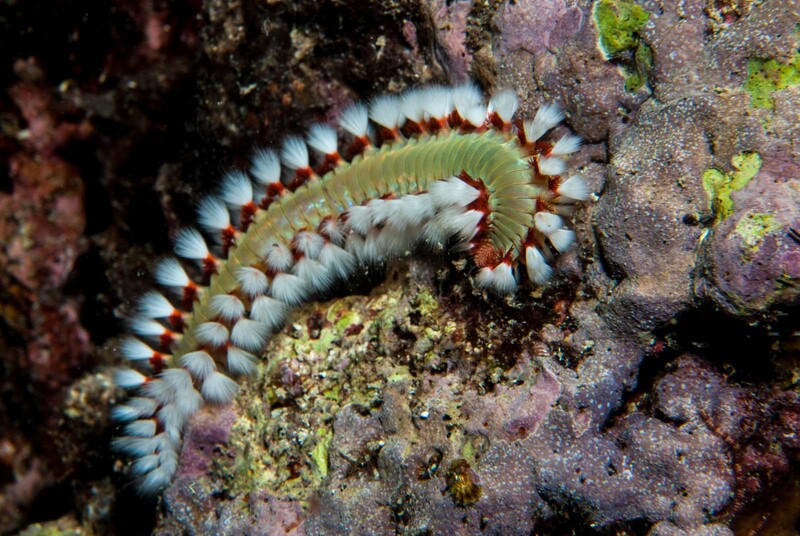 The first fireworm recorded from Ascension Island was collected in the middle 1800s. This fireworm is Hermodice carunculata, however at the time it was considered to be another species due to great morphological variation. 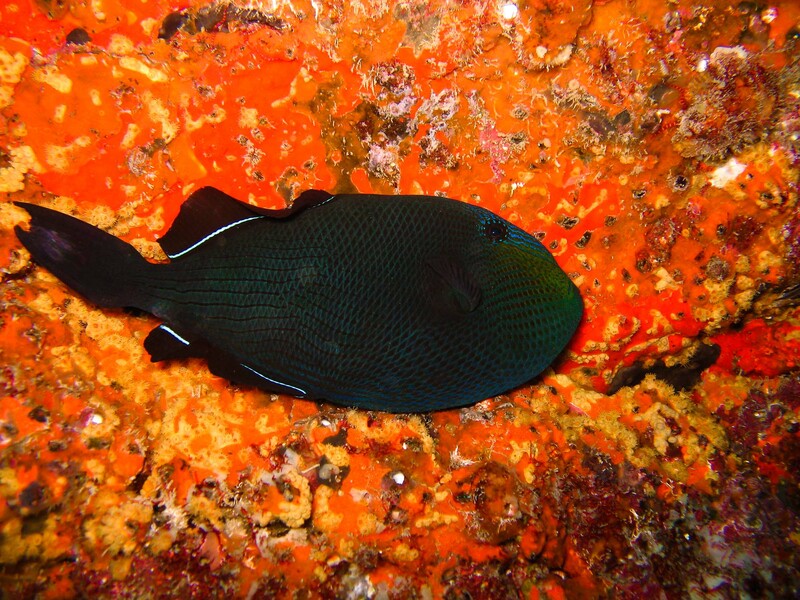 Now, genetic evaluation indicates that Hermodice carunculata have a broad distribution across the Atlantic Ocean. This species shows ecological adaptations according to habitat conditions and different colouration with low genetic divergence. The population from Ascension Island could be playing an important role in the connectivity between both sides of the Atlantic Ocean. 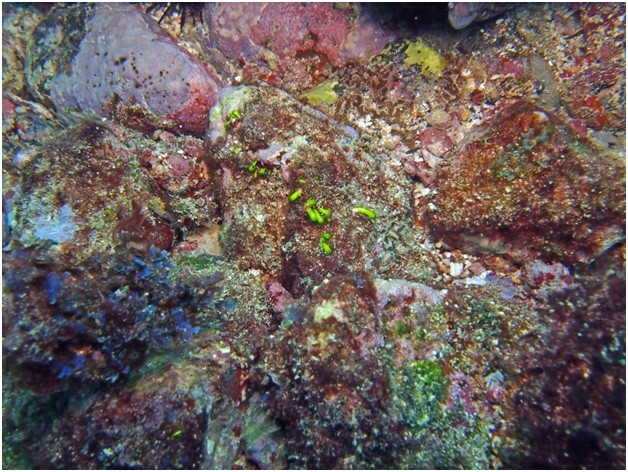 The discovery of Eurythoe complanata represents the first record from Ascension Island. This species has been reported in mainland and some islands of the Atlantic Ocean. 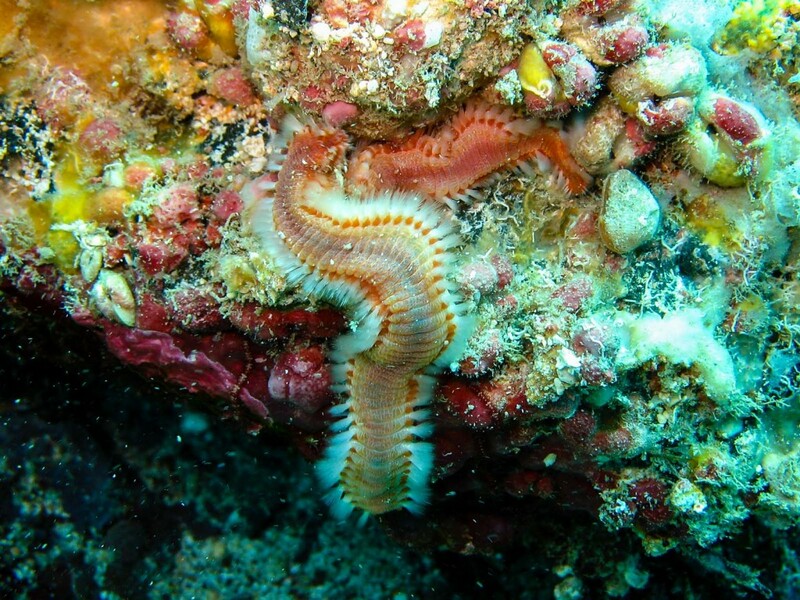 These fireworms are common in shallow waters mainly in rocky shores, and they reproduce sexually and asexually. Sexual reproduction involves a rostraria larvae, which has been hypothesized to enable the long-distance dispersal of this species of fireworm. One of the most common sights for any diver at Ascension Island is the moray eel. It seems that almost every suitable crack, crevasse, fissure, or small cave is inhabited by one or more of these sometimes rather large animals. While generally harmless if undisturbed, it pays to check before kneeling or grasping any handholds as a needle-toothed moray is never very far away! 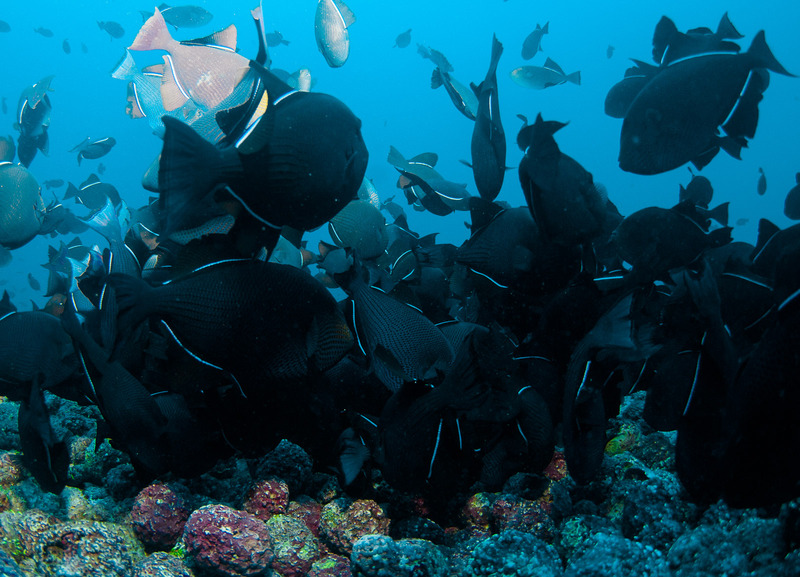 This gallery presents all the species recorded by our cameras during the 2012 survey. Although all the team have now departed Ascension, loaded down with samples and countless photographs, the work will continue long after our stay on the island. 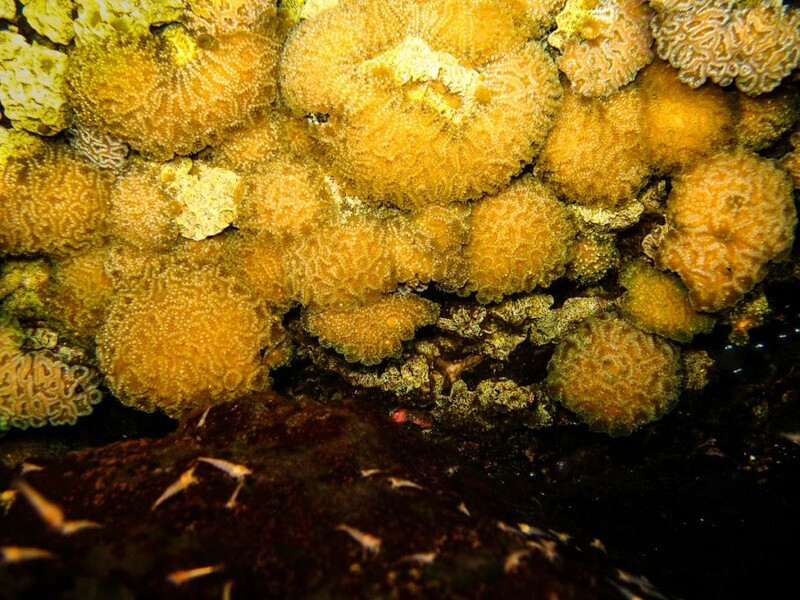 With an entire upcoming edition of the Journal of the Marine Biological Association of the UK to be dedicated to the results of this expedition there is a tremendous amount of work to be done in order to meet publishing deadlines. 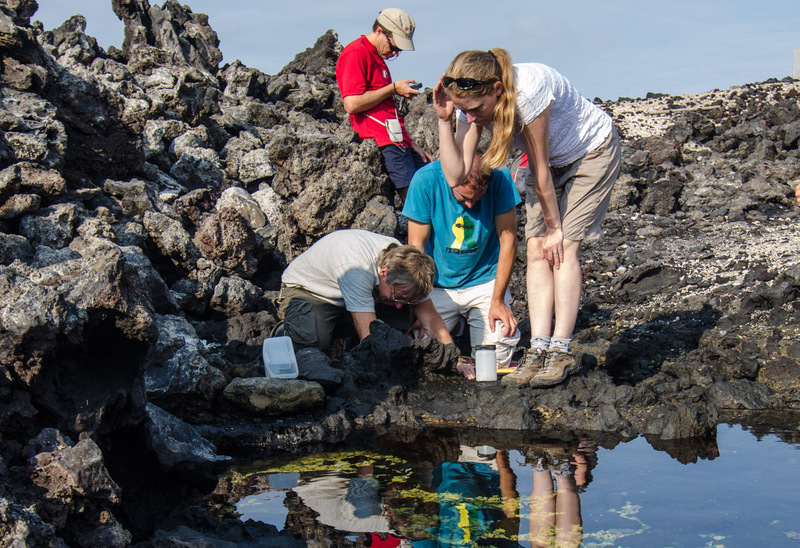 With this ahead of us, the Shallow Marine Surveys Group would like to take this opportunity to extend our deepest gratitude and appreciation to the Ascension Island Government and Administrator, Colin Wells, for their enthusiastic support and keen interest in this ambitious undertaking. 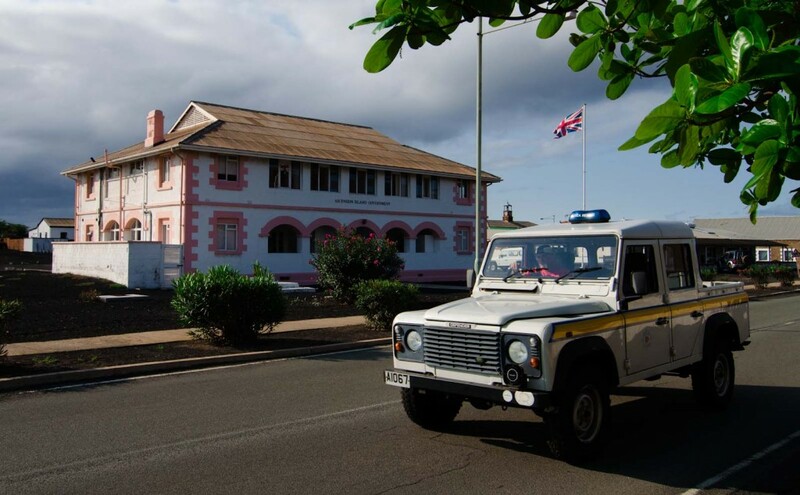 [caption id="attachment_676" align="aligncenter" width="584"] The Ascension Island Government building in Georgetown. 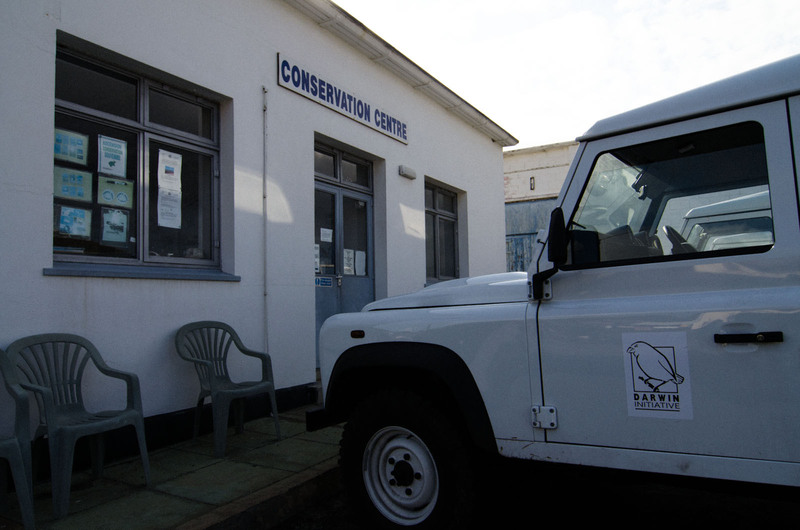 Additionally we would also particularly like to thank Ascension Island Conservation Department for making their facilities available to us, despite the chaos and interruptions we brought to their daily lives. We hope that we will be able to continue collaborating so effectively on the longer term projects we leave behind and also in the future on any further on site surveys. [caption id="attachment_678" align="aligncenter" width="584"] The team took over sections of the Conservation offices during their stay on Ascension. Thank you to all for your hospitality! With the SMSG team now dispersed around the globe, there will be no more blog posts from the island. 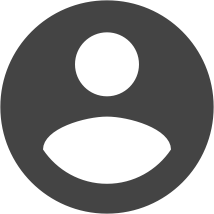 However over time, as work continues on the material we compiled, we'll be occasionally updating the blog with news items. In particular we aim to include galleries of all marine species we photographed as the identification work progresses on the thousands of images we now have. And of course, future expeditions by SMSG will be announced and documented here. 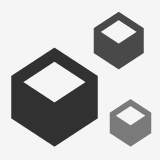 Stay tuned - no doubt there are more exciting developments to come! Farewell Ascension from the entire SMSG team and thank you!